The Perdido Key Association (PKA) has been a public voice and information resource for Perdido Key owners and residents for several decades. A 501(c)(3) non-profit organization, PKA keeps members up-to-date on progress toward important initiatives, such as the Perdido Key Master Plan and Shared-Use Path, and concerns about beach erosion, beach parking, and access conflicts, and traffic flow and safety. PKA Directors testify before the Escambia County Board of County Commissioners and other government agencies to address these and other issues to help preserve the well-being of Perdido Key and enhance its future. 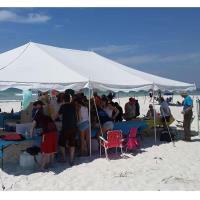 PKA is also a community service organization that organizes a June World Oceans Day celebration and September International Coastal Cleanup Day, both at Perdido Key State Park, and contributes to projects that benefit the Perdido Key Area such as upgrading interpretive panels at the Perdido Key Area of the Gulf Islands National Seashore and Adopt-A-Highway cleanups on a portion of Rt. 98. Membership in the Perdido Key Association is open to all owners, residents, and businesses in the Perdido Key area for $30 a year. For more about the organization, please go to its website at https://perdidokeyassociation.org/index.html.